Ever pondered the who, what, how of Chinatown’s many public murals? Wonder no more! Join the Chinese Historical Society of New England (CHSNE) for a 60-min walking tour of public murals in Chinatown, revealing the stories and history behind them. As an #ArtWeek exclusive, these tours will begin with a behind-the-scenes look at photographs and art from the CHSNE archives! General Admission: $15; CHSNE Member: $12. The tour will begin at the China Trade Building at 2 Boylston Street, on the lower atrium level in front of the CHSNE office and the Chinatown branch of the Boston Public Library. We are a short walk from the Chinatown and Boylston MBTA stops. This event will be an hour-long outdoor walking tour and will cover a lot of ground. Please dress appropriately for the weather and wear comfortable walking shoes. CHSNE reserves the right to cancel and refund the tour in the case of extreme weather conditions. Are you an adoptee 18 or older? 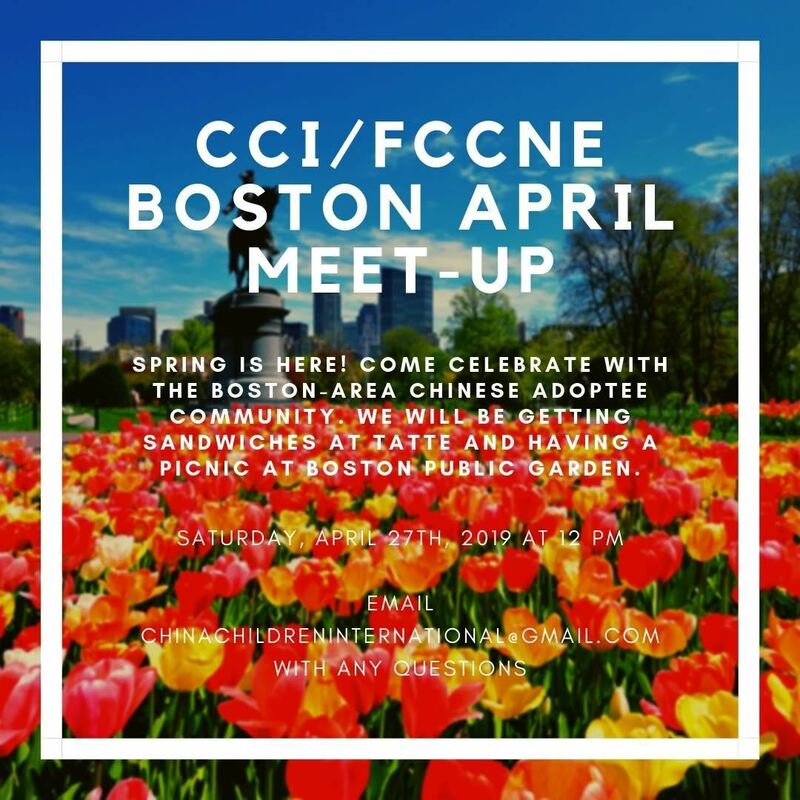 Join CCI and FCCNE Boston for a springtime picnic at Boston Public Garden. Meet with others from the Boston-area Chinese adoptee community, and welcome in the warmer weather with a relaxing break in the sunshine. What: Enjoy the sunshine with a relaxing picnic in the park! Where: Meet at Tatte in Back Bay (399 Boylston St, Boston, MA) at 12:00 PM to buy sandwiches, and we’ll walk over to the garden together. How: Tatte is accessible by the subway on the Green Line. Take it to the Arlington T stop. Food is pay-your-own-way. Either bring some favorite food from home or bring money to buy food at Tatte (or some other nearby place). Also, bring a picnic blanket if you have one! We also advise wearing shoes you feel comfortable walking in and clothes that you don't mind being outside in. Charlotte will be on call day of (cell: 617-959-1409) if you are arriving late or have any issues finding the group. 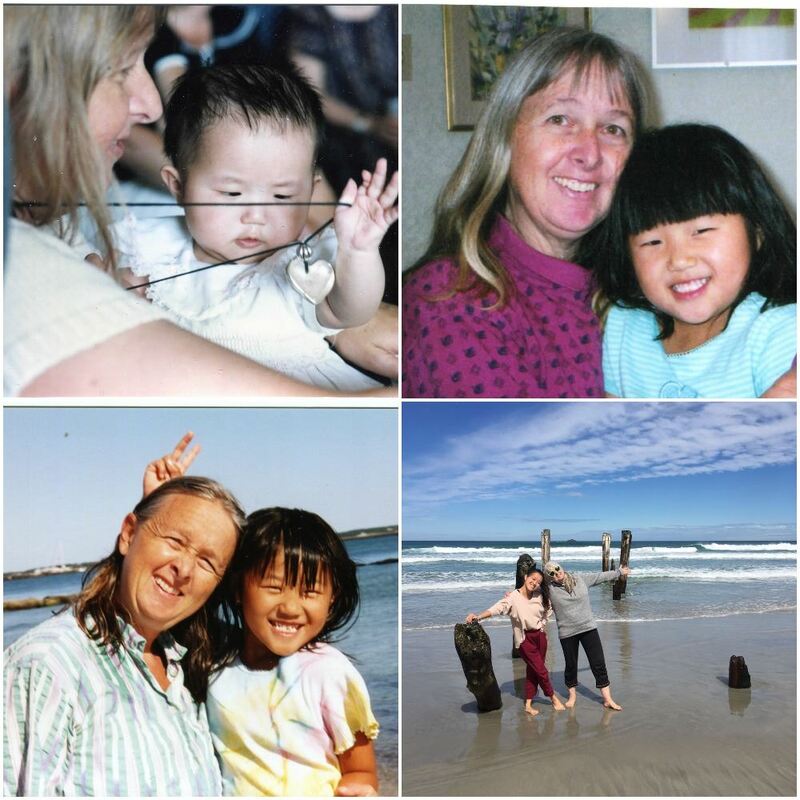 Come hear Maya Ludtke and her mother Melissa Ludtke discuss "Touching Home in China"
Two girls were abandoned in China as newborns and adopted by American parents when they were nine months old. As teenagers, they returned to the farming towns in China where their lives began. Girls their same age who’d grown up in these towns showed the American girls what it’s like to be a rural daughter in 21st century China. As the adoptees and Chinese girls spent time together, they shared stories about their different life experiences, while also discovering some common threads. Maya Ludtke, one of the teenagers who made this journey of discovery, and her mother, Melissa, who wrote Touching Home in China: In Search of Missing Girlhoods, will read from the book and Maya will talk about what she learned about girlhood in rural China and how this experience affected her own sense of personal identity. Maya will graduate from Wellesley College with her degree in environmental studies at the end of May. Melissa Ludtke is an award-winning journalist and the author of On Our Own: Unmarried Motherhood in America. She is writing a book about Ludtke v. Kuhn, her 1978 legal case that won equal access for women sports reporters. She is also a former board member of FCCNE and editor of the FCCNE newsletter The China Connection. 23 Sep 2018 Dumpling Festival at the Central Flea! 26 Aug 2018 Book Party for "A Big Mooncake for Little Star"
25 Feb 2018 FCCNE celebrates the Year of the Dog in Chinatown! 19 Nov 2017 Dumpling Making Class at Mei Mei! 15 Nov 2017 Gund Kwok: Trial Class Graduation Performance! 22 Jul 2017 AARW Summer Grill-Off and BBQ! 04 Feb 2017 FCCNE celebrates the Lunar New Year at the MFA! 28 Jan 2017 The Year of the Rooster Begins! 05 Nov 2016 ASPIRE Roundtable: What's the Importance of a Community of Asian American Women Leaders?" 12 Oct 2016 Author Event: Grace Lin "When the Sea Turned To Silver"
17 Sep 2016 Special FCCNE Program: What is it Like to Find your Birth Parents? 17 Aug 2016 How Chinese Are You? 07 Jun 2016 FCC 14th Annual adoptees Issue Call for art, poetry, photos & more! 06 Feb 2016 FCCNE celebrates the Year of the Monkey at the MFA Boston! 22 Nov 2015 Encore Movie Screening: "My Life in China"
21 Nov 2015 Encore Movie Screening: "My Life in China"
14 Nov 2015 ASPIRE Forum for Asian American students: "Who Am I?" 12 Jun 2015 Asian American Girls Speak Out! 06 Nov 2014 Author Talk: Ruthanne Lum McCunn: "Chinese Yankee"
23 Oct 2014 Boston Asian American Film Festival.